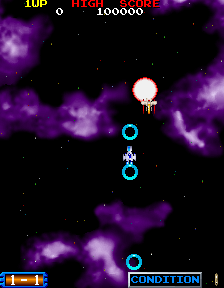 Blast Off was released in Japan in 1989 and is the sequel to the space shooter Bosconian which was released in 1981. Created by Namco this game is pretty much the typical vertical space shooter in where it is you versus and army of enemies, however your ship is armed with some pretty badass weapons. One thing that is a little different is your ship can switch weapons and while that in itself is not unique, what is, is the fact that dependent on the color of the laser you select you can shoot behind you.